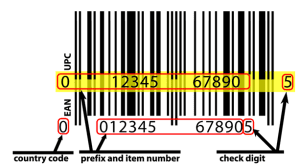 UPCs and EANs are a family of barcodes called GTINs. GTIN stands for Global Trade Identification Number. UPCs and EANs are related. 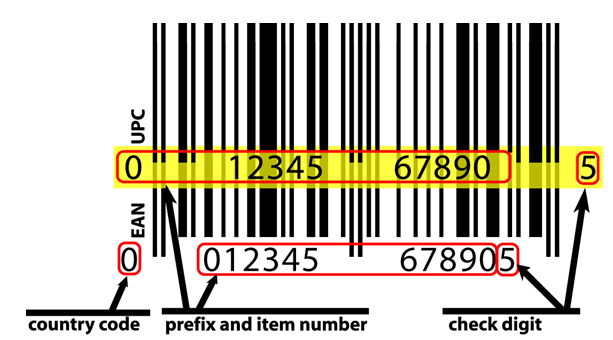 The GS1, the original source for barcodes has created the confusion between UPC (Universal Product Codes) and EAN (European Article Numbers also called International Article Numbers). The UPC-A barcode was the original format for product barcodes. As demand in Europe, Asia and Australia started growing, country codes were added. US and Canada have a a country code of zero which is not printed under the barcode nor is it entered in US and Canadian Inventory and Point of Sale Databases. If you look at the graphics above, you will see they are exactly the same. The width of the bars and the width of the spaces between the bars are exactly the same. The only major difference is the placement of the numbers below (human readable numbers) which are there only as a back-up in case the barcode doesn’t scan properly and the information has to be manually entered into the point of sale system. Taking this a step further, we have overlaid the UPC and the EAN graphics (symbologies) so you can see that the graphic is identical. The country code doesn’t appear beneath the barcode in a UPC since the GS1 didn’t grasp the importance of US andCanadaindicating country codes. They felt that since the majority of products sold in both countries originate from importers, distributors or manufacturers in theUSorCanada, they could forego the leading zero in the human readable numbers. We still believe that if you are currently doing business in the United States and Canada exclusively, it is safer to order UPC barcodes for your products. Many retailers, especially smaller retailers may be using older accounting and inventory systems that only allow them to enter in 12 digit UPC numbers and not a 13 digit string. If this changes in the future, you can convert your 12 digit UPC to a 13 digit EAN by adding in the country code 0. There is nothing on the horizon indicating that the USa nd Canada will ever switch over to EAN 13 barcodes. This following information is used with permission from George Laurer– http://www.laurerupc.com . Mr. Laurer is the inventor of the UPC barcode. “U.P.C. Version A” and “EAN-13” are and always have been 13 character symbols and the numbers themselves have always been 13 characters long. The U.P.C. (Version A) symbol and the EAN13 symbol are essentially one and the same. They both have the same number of bars and spaces. * I have used the name UCC throughout to avoid confusion although it evolved to this name over many years. In 1975 it was called UPCC (Uniform Product Code Council). The origin of EAN vs. U.P.C. confusion. When I conceived the U.P.C. for the grocers in the U.S.only 12 digits were required including the check character. I designed a symbol in which the left half of the symbol was composed of “odd” parity characters and the right side was composed of “even” parity characters. Each printed character has two bars and two spaces and is made up of 7 modules. Odd parity simply means the printed representation of the numeric digit has an odd number of dark modules. Conversely even parity printed digits have an even number of dark modules. The UCC* chose to call the U.P.C. a 10 character symbol and they chose to print only 11 of the characters in human readable form. The 10 characters identifying the manufacturer and item were printed below the bars. The “system number” character was printed halfway up the left side. Further, they chose to carry only 10 digits of the number in their files. The reason was both political and practical. Before the symbol marking was considered a well know consulting firm had been hired by the fledgling UCC to determine the number of digits needed to accomplish the goals of the grocery industry. Considering many factors, not the least of which was the limited power of computers of the day, a figure of 10 digits was recommended. It was a tough sell to convince the many groups involved that they would have to change whatever numbering system they were using to the new 10 digit number. Rather than admit that the consulting firm was wrong and so as not to open the number of digit argument again, the decision was to maintain that the U.P.C. was a 10 digit symbol and number. Another factor considered was that it was more difficult to key the EAN human readable that the U.P.C. human readable when the symbol did not scan. They fostered the illusion by requiring that the check digit be stripped at the scanner. The SN (system number) was necessary for in store processing but it was not needed in records transferred between systems. The illusion was reinforced by not printing the SN in line with the 10 product identifying digits and not printing the check digit at all. After the U.P.C. had been in use several years, Europerecognized the usefulness of the U.P.C. but realized a 13th digit was needed to identify the many countries. I encoded the extra digit by encoding the left half of the symbol with 3 characters of even parity and 3 characters of odd parity and then arranging them in various patterns, each pattern representing a different country code. The scanner recognizes a series of digits as the right half of a symbol if the parity of the characters is all even and it recognizes the left half if it is composed of all odd OR if three characters are odd parity and three characters are even parity characters. With the acceptance of the EAN in Europe it was understood that the U.P.C. was actually 13 digits because the parity pattern of the left half of all odd characters was assigned the value (or country flag) of “0”. I pointed out that the UCC only printed 11 of the 13 digits and carried only 10 digits in the system. The UCC continued the delusion by using the foolish argument that “0” means nothing and therefore could be ignored. On the other hand, the European’s were smart enough from the very outset to call the EAN symbol what it is, “EAN-13” and they printed all 13 characters. Systems inEuropecarried all 10 country flags including 0 in their records and their systems could process both U.P.C. and EAN symbols and/or numbers. TheU.S.groceries chains at the time were selling very few foreign goods and saw no reason to spend money modify their installed equipment. Although the U.P.C. was not widely accepted at that time, the UCC accommodated the foreign companies by issuing them U.P.C. numbers with the invisible country flag of “0”. Although this was a burden on the European companies and was a waste of numbers since many European companies had both U.P.C. and EAN-13 numbers, it wasn’t until two decades later that something was done about this. In 1997 the Uniform Code Council, Inc announced project SUNRISE. This initiative required that all U.S. and Canadian companies must be capable of scanning and processing EAN-13 symbols, in addition to U.P.C. symbols, at point-of-sale by January1, 2005. This has been completed, the UCC has changed its name to GS1 US, and they have taken the responsibility of controlling both U.P.C. and EAN numbers. Simply put the U.P.C. and EAN-13 symbols and numbers are the same. Below is a U.P.C. symbol with its equivalent EAN-13 superimposed in red. One can see that the bars and space are the same, only the human readable is different. Note that the U.P.C. has evolved in that the check digit is now printed and also that the SN has been brought down in line with the other characters but the country flag is still not printed. I would expect that in the near future the human readable will also be changed to the EAN format. Because there are more than 9 countries, the country flags have been further subdivided by using the next two digits for various uses and countries. TheUnited StatesandCanadahave the country flag 0 and subdivisions 000 thru 139. It is interesting to note that the publishing industry produces so many products that it is its own country called “Bookland” for number assignment purposes. Bookland has been given two subdivisions of the country flag 9. They are 978 and 979. –end of article by George Laurer.